The Wii’s biggest selling point is its motion sensing controller called the Remote. After playing Wii Sports for two months, I think the Wii Remote is a decent controller. The motion-sensing isn’t that precise or accurate, but it gets your arm moving, and it’s kind of fun to pretend to play sports. While I like the Remote, the Nukchuk attachment could be better, mostly on the fact that there is wire connection between the Nukchuk and the Remote. The wire can get in the way during Wii Boxing (since I like to actually throw punches instead of just moving my wrists). It would be better if the Nukchuk was wireless. 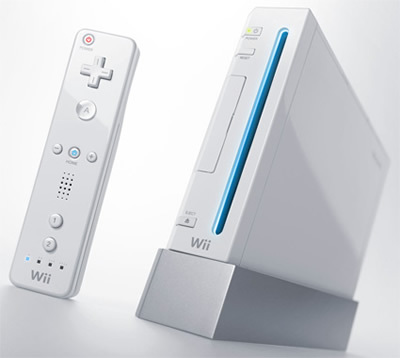 As for the console itself, the Wii’s design is attractive with its white case and blue lights. Build quality seems to decent, even though I don’t really plan to test the console’s sturdiness. Setting up the console was pretty straight forward, and the only hiccup I ran into was setting up the Wii’s Wi-Fi connection, but that was the fault of my router rather than the Wii. I have the Internet Channel installed on my Wii, but I never use it. Since my family didn’t bother lining-up on Boxing Day, Wii Sports remains the only game in our library. As expected from a bundled game, Wii Sports makes very good use of the Remote in various fashions. Here are my impressions on each of Wii Sports’ five sports. Tennis along with Boxing are the best sports in Wii Sports. It’s mostly a reaction game with some elements of timing and swing control involved. Tennis is the first sport that I reached Pro status in, and it is usually the first sport I play after turning on the console. Despite beating the hardest CPU opponents Elisa and her partner several times, I still haven’t gotten to the point where I can consistently defeat them. I usually play Tennis until I win a match, and that sometimes takes several tries. I’m a bit sick of seeing Elisa’s team though. Why can’t Tennis rotate between different opponents with around the same skill level (like in Boxing)? As for techniques in Tennis, I find it is bad to swing my arm like in real tennis. It’s better to just use short swings since you can react quicker. I’m not sure if I’m giving up swing control by making short swings, but I find it no matter what I do, sometimes the ball just clips the net and goes out. It never seems to happen to the CPUs though. As for strategies, dominating from the front court is the easiest way to beating the CPUs. If I can get the CPU to run left and right a couple times without hitting the ball out then I can probably put the CPUs away. Compared to Boxing and Tennis, Baseball isn’t quite as fun since it’s just batting + pitching practice. The design of Baseball makes it harder for the player immerse into the game. Baseball has been a mixed bag for me, since a few days ago I was stuck at about level 600 because I can’t hit worth a damn. The last game as my drought ended in a 0-0 tie where I lost a few experience points. However, today I blew open the CPU opponent 12-3 in the second winning and incited a Mercy Rule victory, and during the game I kept connecting with home runs. A week ago I wasn’t able to hit diddly squat. I guess the computer must have taken pity on me and made it easy. There’s no real strategy to hitting other than trying to judge the pitch and hit it as hard and far as you can, but I’m bad at judging the pitch. I can tell if the pitch is coming too close to my Mii, but the Splitters always gets me. As for pitching, I eventually figured out the common sense strategy that it was best to pitch either really close or really far from the batter and never in the middle, but that was after the CPU hit a couple of home runs on me. I also found out how to do the fast pitches by flicking the wrist, but the pitching position seems to matter more than the speed when it comes to the CPU’s ability to hit my pitches. Finally, Baseball is one of the sports in the game that actually hurts my arm, and that goes for both pitching and batting. Bowling is one of the two sports in Wii Sports that doesn’t get harder as you get more experience points. This is third sport for which I reached Pro status, but I was stuck at 900-ish for quite a while because I kept bowling about 150. My personal best is 244, and that was the only time I have ever reached over 200 in score. Wii Bowling isn’t really a great representation of real bowling, but the strategy for getting strikes is still to bowl hard and hit the gap between the 1 and 3 pins (since I’m right-handed). My strikes are pretty inconsistent, but it’s still much better than what I can do in real bowling :D. The last time I went bowling (which was a long time ago), I think I got around 70. Golf is the other game that doesn’t get harder as you level up. Wii Golf is mostly about judging swing power plus a bit reading the winds (when hitting long) or the terrain (when putting). It’s definitely possible to birdie on the all the holes, but I fail to see how you can get an eagle or below on any of the holes without some holing it with an iron/driver/wedge. My best score on all three of the courses are -1, and the only hole that I sometime have trouble with the the last hole on the hard course. It’s so easy to crank it into the water on that hole. Golf is probably the least exciting sport in Wii Sports, and it’s probably the game that I play the least. We saved the best for last. Wii Boxing is easily the most exciting game in Wii Sports, and it can be a decent workout if you actually swing your arms (I do). At the beginning, I just swung away like a maniac because it was fun pummeling my opponents with ten hit combos. This stopped working at around Level 700 when CPU opponents begins to dodge, block and counter-punch. At the higher levels, Boxing is all about dodging and counter punching which is sort of like real-life boxing, but of course real-life boxing doesn’t have the slow-mo sequences. These days I just mostly dodge left and right and try to get a quick combo in when there’s an opening. I’m currently at about level 1400 and still haven’t faced the boxing champ Matt, but I have beaten Elisa (who is supposedly the boxer before Matt) three times with two KOs and one decision. I’m confident I can take Matt out. While Wii Boxing is really fun, one big gripe I have about it is that the motion sensing. I’m not sure if I’m standing too close to the sensor bar, but a lot of times my punches just don’t register, or the system registers the incorrect punch. It’s really imprecise and can get pretty frustrating. For this reason I have trouble landing the head hooks which do a lot of damage, but I make do with body shots though. My favorite combo is left body jab/right body hook 1-2 combo since it’s the easiest to land and does a bit more damage than left-right body jabs.